This page is a few tweaks away from the top 10! The first important change would be to the title tag on the page. 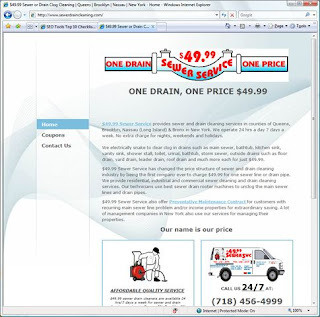 Presently it reads "$49.99 Sewer or Drain Clog Cleaning Queens Brooklyn Nassau New York - Home". Well a common issue with some sites is that although information may be relevant for the owner it really doesn't match what people will search for. In this case the "$49.99" I would suggest be removed from the title tag as well as "or" so that the title reads "Sewer Drain Clog Cleaning..."
I am sure no one will know the exact price they are looking and certainly will not search for it so having "$49.99" in the title takes away from the search rankings. Taking out the "or" adds some relevance ranking points as you will get "sewer" and/or "drain" and people looking for "sewer drain". As is don't on this pages, including your pricing on the page is where is should be. As this is a focal point of the page and part of the sales position it works well in the page. Take the irrelevant content out of the title!